Diagnostic tests for measuring various health parameters usually involve drawing blood, which is invasive and kind of icky. But a team of researchers at the University of Cincinnati and the US Air Force Research Lab have invented a much less painful system that involves using sweat to track health. 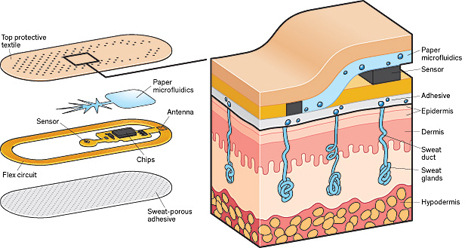 The system involves a Band-Aid-like adhesive patch that uses microfluidics to collect sweat from the skin. You don’t have to run a marathon to work up a sweat; the device will use an electrical process called iontophoresis to stimulate the production of sweat. 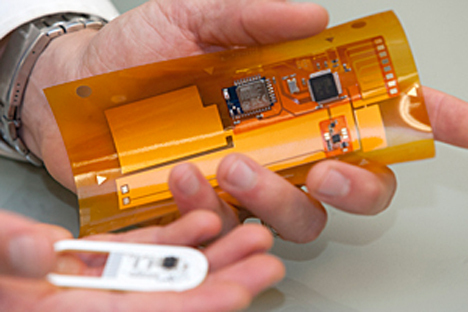 The process applies a very small electrical charge to the skin – so small that the pain experienced by the patient is minimal. The method can keep sweat flowing from a very small area of the skin for hours or even days if the researchers need it to. 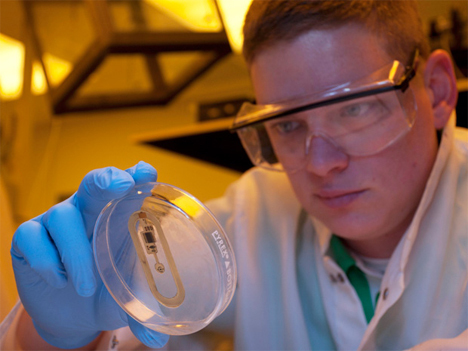 The patch then wicks away small amounts of sweat via microfluidic channels for analysis. Super-absorbent hydrogels keep the sweat pumping even after it’s passed through the sensors by soaking up the old sweat so that it doesn’t mix with new sweat. 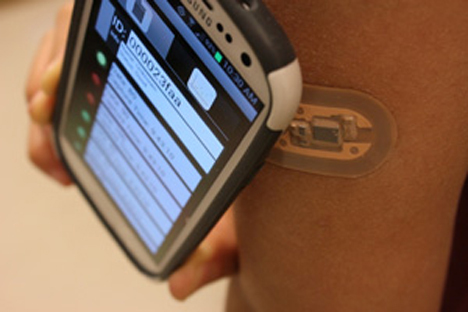 The electronics in the patch have no power source of their own; the patch contains a small RFID-like chip that is externally powered by a smartphone. It’s this smartphone that provides the analysis, as well. 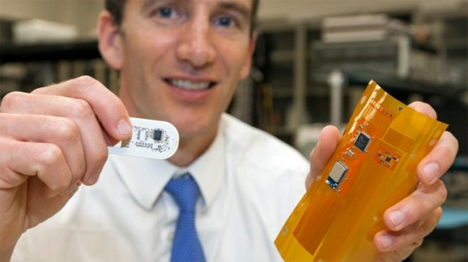 Initially the team had their collective eye on using the patch to monitor athletes’ health. Knowing when your electrolytes are low can be crucial when you’re training, which is lucky because electrolytes are simple to measure. The team thinks they will soon be able to measure other factors like lactic acid, metabolites, proteins, amino acids, and creatinine with the patch. Although measuring glucose, or blood sugar levels, would be an amazing use of this technology, science has yet to figure out how to do that using sweat. The system could be useful for a huge number of people and situations. Premature babies could be monitored for any changes in their general health. Medication levels in a patient’s sweat could help doctors to determine correct dosages. Military members could be monitored in the field for signs of muscle exertion, injury, and exhaustion. A large number of other physical factors can be read through a person’s sweat, so there’s a good chance that in the future you’ll be experiencing fewer blood draws but more tiny electroshocks to analyze your sweat. See more in New Materials or under Science. November, 2014.